To have your event posted, send a brief write-up, including Date, Time, Location, Cost, Contact Info, and sign-up form if appropriate. Send to webmaster, Rob Lockhart. To place your event in our monthly newsletter, Set&Link, copy the message to Donald Holmes. Special classes for millennials continue, April 25, May 2, May 9. More info here. Arlene Koteff invites you to a Funday Sunday! Come knowing up from down and right from left and see where that leads. Arlene will teach dances with familiar formations — from a slightly unfamiliar perspective. Although spring has officially sprung, it will actually feel like spring in time for our Bluebell Spring Dance!!! Once again, Laird Brown & Don Wood will be turning cabin fever into dance fever! Dancing is followed by a light supper: $10. Newer Dancers Welcome! Come join the celebration! Dance to the wonderful music of Fred Moyes. Join us for the 50th Annual “Beginners’ Ball”. The dances are do-able, the food is great, the room is beautiful, the atmosphere is electric. What more could a dancer ask for? with the wonderful music of Don Bartlett on piano. Your $10 entry fee includes light refreshments at the interval. Tickets $10 at the door. Dancing starts at 7:30. Que les fleurs poussent! (May the flowers grow! ), may the people poussette. Come join the Glenview dancers for a celebration of spring. Dance to the live music of Fred Moyes. Tickets $15 at the door. Dancing starts at 7:30. Refreshments following dancing. Glenview Presbyterian Church, 1 Glenview Ave.
St Andrew’s of Brampton invites you to our traditional spring dance. Come and dance on a great wooden floor! Programme will be posted here. Cost is $8 at the door. Refreshments follow dancing. The Oakville Scottish Dance Group invites you to our Spring Dance. Music and dancing to Don Bartlett and Jim Darge. Doors open at 7pm; dancing at 7:30. Tickets are $15, plus a contribution of finger food for intermission. Come and join the fun at Edwards Gardens! Every Tuesday evening in June. and live music by the Scotch Mist band. Give it a go, or just enjoy the music, and the spectacle. Dancing will be from 2 - 5 pm, followed by our usual dinner. Ticket prices are $75 pp for dancing & dinner, $40 pp for dancing only and $40 pp for non-dancers (dinner only). and our Demo Pool has a gig prior to the June 16 (Fathers’ Day) matinée performance. They will be in the courtyard of the Festival Theatre. to our advertisement in the Shawfest brochure. Seeley Hall has been booked for the traditional Trinity summer program. This popular programme has been offered by Trinity for decades. The program will feature guest teachers invited by David Booz, and dance selections will be suitable for a range of dancers with mixed abilities. Dancers of all ages are invited to join in the mass dancing of the Opening Ceremonies and to promote Scottish Country Dancing. Sign up as a 4-couple set representing your dance group or come on your own. Individual dancers will be matched up to form sets (if enough numbers). We’ll dance three short, simple dances. A free CD of the music will be available for your group to practice. Parade at noon. Opening Ceremonies at 1:30pm. 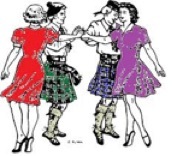 The Scottish Festival Committee hosts a ceilidh at the local Legion Branch 34, Friday July 20th from 6-12pm. For tickets call 705-487-5868. On Sunday the 22nd there is a wee afternoon party bash at the Royal Canadian Legion with live entertainment – FREE! September 20 & 21 - The Keppies are Coming! a sort of Haliburton reunion, CD launch, and Last Chance Tour. It has been 10 years since the fun workshops with Duncan and Maggie at the Haliburton School of the Arts. So, it seems time to re-visit the delightful challenge of various Keppie formation and dance ideas. This ceilidh is designed for dancers (intermediate and advanced) AND those who would like attend but not dance. Save the Date: Bring your family and friends to the annual Family Ceilidh! Enjoy an afternoon of dance, followed by refreshments. Keith Bark will lead the dancers with his customary wit and wisdom. (2 minutes’ walk from Lawrence Station). the ability to phrase and execute all steps to a high standard and assimilate instruction quickly. At this meeting Alicia Manson from Oakville will share dances to enjoy. At this meeting Claire Collier from Buffalo will share dances to enjoy. Meantime, if you have questions, contact Christy Barber. At this meeting Donald Holmes from Toronto will share Highland steps. All are asked to contribute a “bring and share” item. At this meeting Maureen Richardson from Aurora will share dances to enjoy. At this meeting Moira Korus from Toronto will share dances to enjoy. 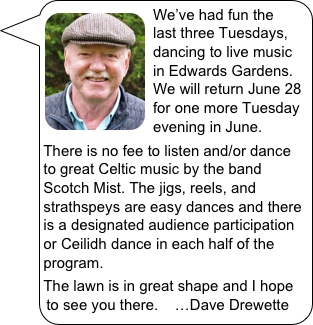 At this, our season closer meeting, Lou Emslie from Guelph will share dances to enjoy. typically in some exotic location worldwide (e.g., London, Bonn, Glasgow, Paris...). Toronto and St Petersburg, Russia. Details are in development. Meanwhile you could check out Spring Fling 2019 in Paris. Typically, there is an accompanying Spring Fringe for adults. 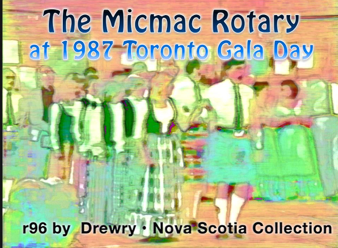 RSCDS Toronto is an affiliate of the Royal Scottish Country Dance Society, based in Edinburgh, Scotland. HM Queen Elizabeth is our Patron.